Nestled on the lower floor of The Address Downtown Dubai, Em Sherif overlooks the Burj Khalifa and is accessible through both the hotel and via Dubai Mall boulevard. A lively, popular import from Beirut, the restaurant welcomed my dining partner and I with the sounds of traditional Lebanese live music, creating an authentic, cosy atmosphere. Despite magnificent water fountain views from the outside terrace, we opted to dine inside, where the walls were draped with Ottoman-styled plates and mirrors, on a pale blue backdrop with deep purple accents scattered across the drapery and tableware. 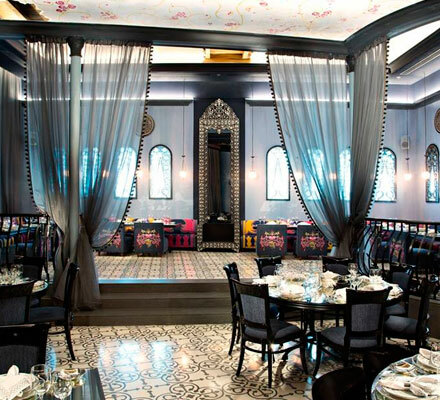 The restaurant’s décor was shabby-chic, yet it retained an air of fine-dining sophistication – offering a unique Arabic vibe that I’ve not yet experienced in Dubai. Upon arrival we were quickly told that there was no a la carte menu available, however, that we would be served a set menu comprising 32 individual dishes – despite being just a table of two. Shortly after, our feast began. To start, traditional dishes such as tabbouleh, fattoush, and man’ousheh, were served, sharing-style to the table with warm, in-house baked bread, and the cold mezze to follow. Before we knew it, the table was overflowing with labneh, moutabbal, hummous, shakshouka, kibbeh nayyah, a beef tartare-like dish, plus warm mezze dishes, including fatteh, arayees, and ginger spiced prawns, which were all delicious. By this point, we were both rather full, however, then came the grilled meats. Succulent pieces of chicken and lamb kebab, cooked and seasoned to perfection, were served, alongside a rice and chicken dish. Our helpful waiter noticed we were beginning to struggle, so gave us a comfortable breather before bringing out the five desserts. Of course, a warm umm Ali was presented and tasted wonderful, in addition to a stuffed pastry called tamriyeh and a creamy mohalabiyyeh with crushed pistachios. Capped by a serving of Arabic coffee, the experience was extremely enjoyable. Although I’ve never visited Beirut, I envision it being somewhat a replica of the authentic eateries there. Would I return? Definitely, however, would be sure to fast the day prior – the food served for two would have easily served four, if not more! Best for: A get-together with friends and family.